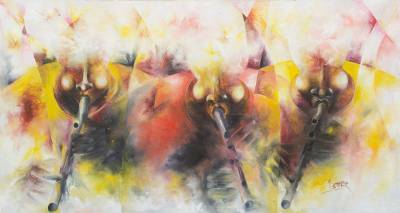 Abstract African Musicians in Signed Cubism Painting, "Praise the Flute"
Musicians appear through a mist of color playing their flutes in a remarkable painting by Ghanaian artist Prince Asher. "There are messages of love and affection to both the living and the dead through the great African flute," says Prince Asher as he confides the origins of his inspiration. "The flute is used in many ways, such as at funerals to pay respect for the dead, as well as in other happy occasions where unity is the main subject." When I went to pick up ""Living Sisters"" from the framing shop, the proprietor could barely bring herself to give it back to me. Indeed, it is a riveting and powerful painting, and now that it's hanging in my home, I can't take my eyes off it. It's obvious that it will forever be a center of attention. I am in awe of Prince Asher's talent.